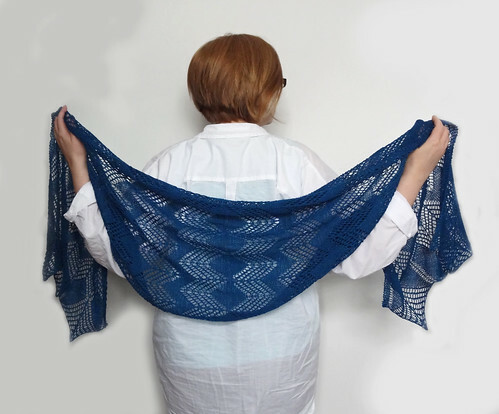 Do you remember way back in January I reviewed Scrumptious Collection Volume 3, the new pattern book for Fyberspates Scrumptious yarns? 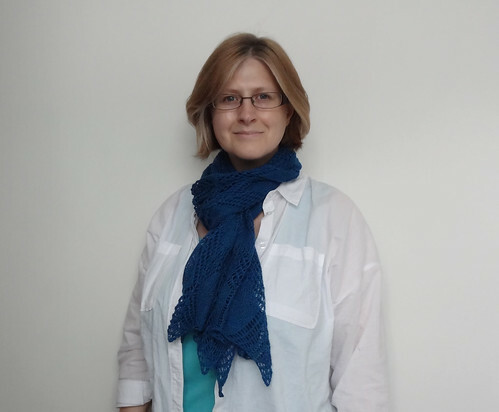 I told you how much I loved the Simene Stole by Melanie Edgar and in April I cast on that pattern, using yarn I bought especially to knit it (which is actually quite rare for me, I normally buy yarn and then find a pattern to fit). The yarn I chose was Fyberspates Scrumptious Lace in Teal. I have knit three other shawls in this yarn and haven't kept any of them. 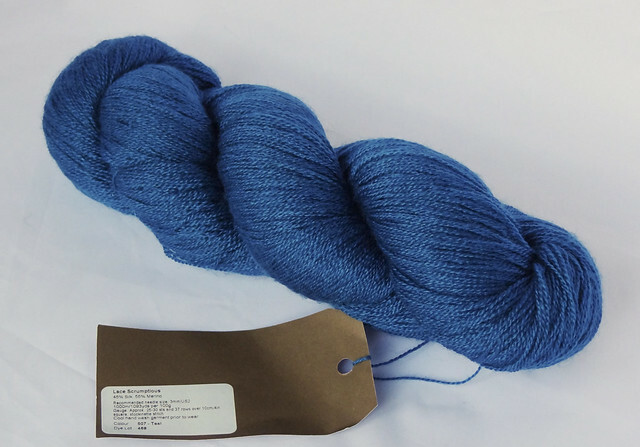 I adore this yarn and desperately wanted a shawl that I could keep. The yarn is 55% merino and 45% silk. It has a wonderful mix of warmth, strength and gleam. 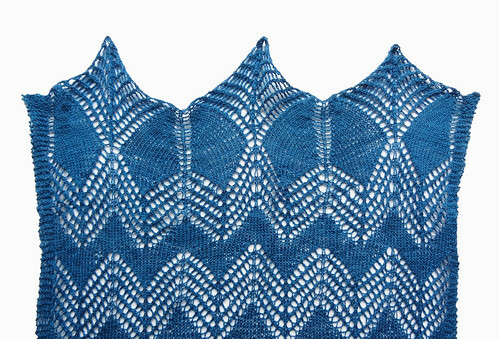 After deciding I wanted to knit this pattern I found that the shawl took quite some time to finish. It was something I was happy to pick up and put down in between other projects to keep things entertaining. It is knit in two halves, starting from the ends and working in. This allows the ends to be an interesting shape, with plenty of stretch. I love the way it blocked out. 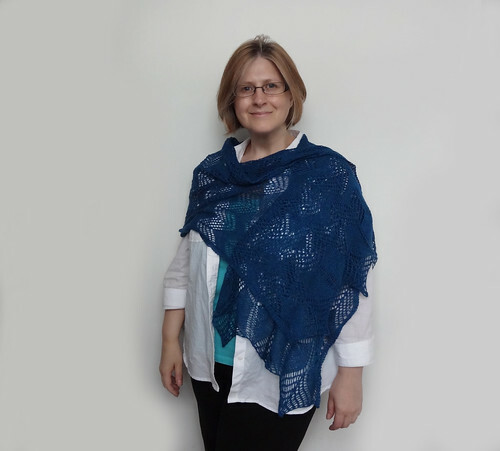 The pattern is really quite simple, once you have done the first section of the shawl. The main chart is really easy to read in relation to the knitted fabric. This means the lace is just interesting enough to keep your brain engaged without being overwhelming, or too taxing! It was just the right level of tang for me. Joining the two halves of the stole in the middle creates a really interesting mirror image. It forms diamonds out of the chevron lace. 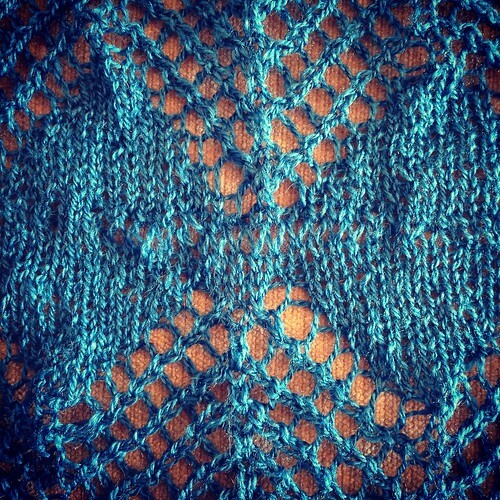 The centre stitches are grafted together. My first attempt of grafting went a little awry, and I didn't realise until I'd spent a couple of hours on it, slowly and carefully working towards the end. I nearly cried when I saw the wonkiness. It's only one stitch out but I knew it would drive me crazy so I put it away for a week, or so, until I got over my sadness and frustration. I know ripping it out and working on it again was the right thing to do. Those lovely diamonds wouldn't have been created if I hadn't fixed it. 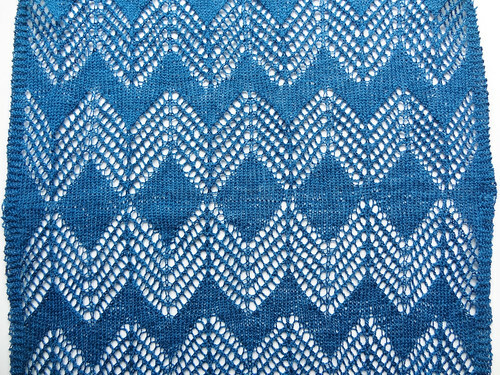 In order to make sure it lined up I marked the centre stitch at the top of each lace chevron peak, on both halves of the stole, and made sure as I worked across to join up those marked stitches on either side. It took a while (again) to graft it, but the result made it worth it. I initially learnt how to graft years ago by using Woolly Wormhead's tutorials, which are excellent. She goes into a great amount of detail on the different kinds of stitches to graft, so it's well worth a look. Now I understand the principles of grafting I just need a gentle reminder of the pattern of the needle movement. I use the post on the Wise Hilda blog that gives a quick memory aid. 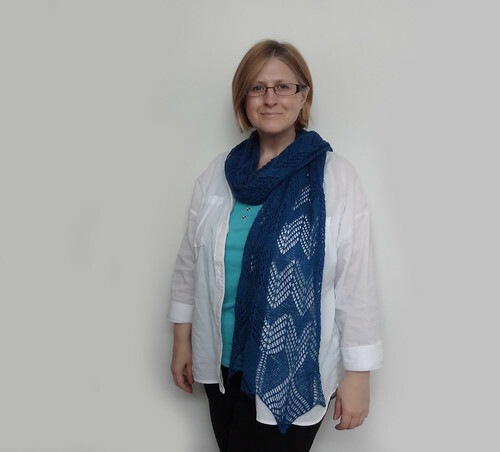 I actually made the stole bigger than the pattern states. I added an extra chart repeat on both halves to use up more yarn and create something bigger. I an ample woman so I wanted to make sure the stole would wrap round me properly. I think it was the right call. It's a good length for me, but I think someone more petite would be fine with the recommended repeats. In fact, the extra length meant I couldn't block the shawl in the house. Luckily it is Summer and we have actually been having nice weather. 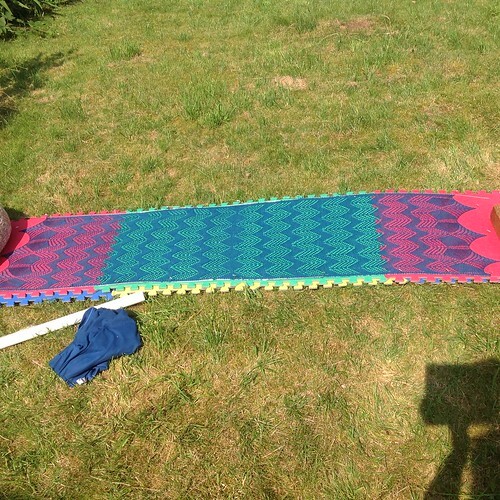 I decided to block the shawl out in the garden. It was dry in about an hour! I used my blocking wires along the straight edges and then simply pinned the top of the three peaks on each end. I absolutely adore this stole. It is exactly as I envisioned it. It drapes so beautifully, that I play with it constantly! This is going to be perfect for wearing as a scarf as well as stole. Because it quite wide and long, it can be worn doubled up around the neck, nice and snug. As there is quite a lot of fabric it should trap lots of air and actually be really warm in cooler weather. This stole is all that I hoped it would be. It makes me so happy when I see it and the size means it will wrap around me enough to keep me warm, but it's light weight means it will compress easily to fit in a bag or suitcase for going away. I cannot express quite how much I love this project. It was fun, and still challenging enough to keep me interested. It was easy to spot when I'd gone wrong and the yarn was a dream to knit with. I also know I will use this stole a lot. 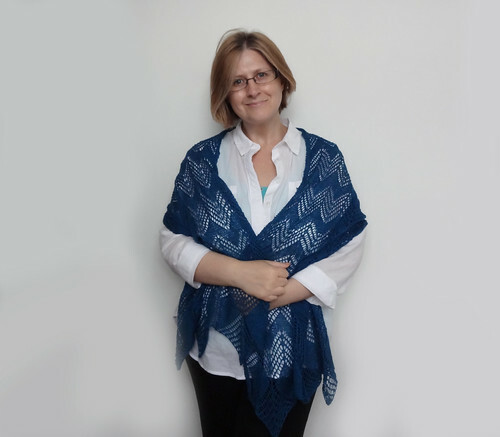 This is the second pattern I've knit from this pattern collection and I love both of them. I'm sure there will be other things from it I will get round to knitting too as it really is a good value buy for such wonderful designs.